My journey to flower farming reads almost like a gardening love story. Growing flowers and living what I consider “the good life” of faith, family, and farming leaves little on my want list. It all started because I got the guy and he came with a big garden. Actually, it was far more than a just a garden — it was a family homestead that also came with a strong tradition and history of gardening. I was totally smitten from the start by him and this way of life. …Steve had been living in this place as a bachelor for many years before I came along. In addition to gardening, he had an interest in motorcycles. 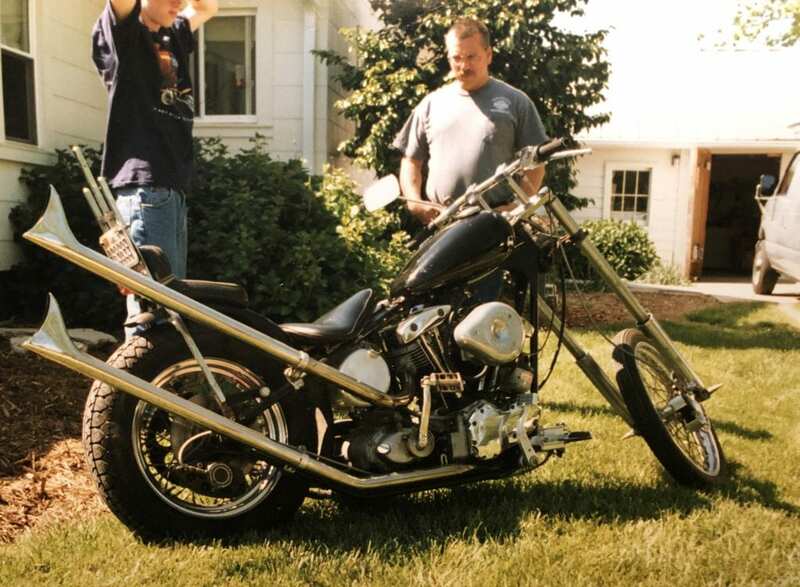 The house apparently was perfect for re-building his 1968 Harley Davidson Chopper in the living room! So glad I missed this. The stories this house could tell: from the babies born to the Brunk family who built the home in the 1930’s to a Harley roaring up the front steps in the 1980’s — thank goodness walls can’t talk! 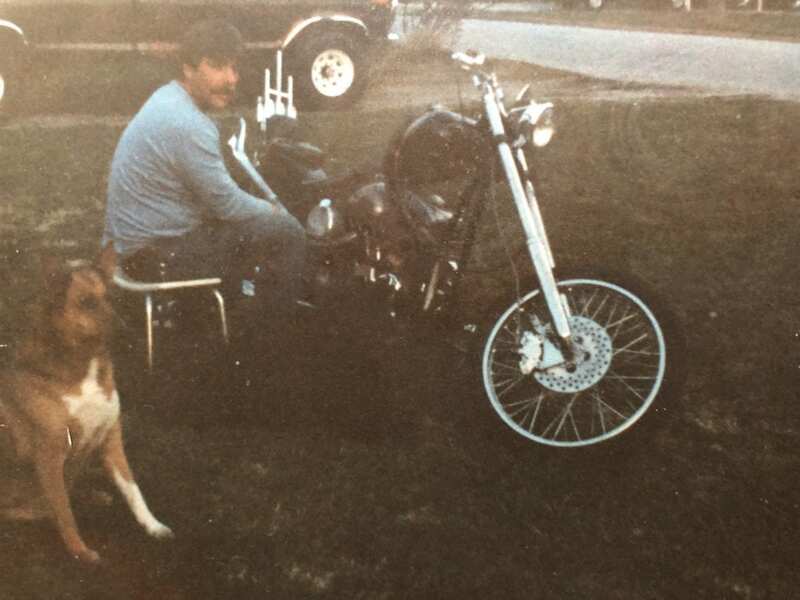 Steve with his 1968 Shovelhead Harley Davidson back in the day. A moment of Harley gazing. Yes we still have it! So, to the front of Cool Flowers it went. My editor, Cathy Dees really hit the nail on the head with this decision — my readers do love this story. I have received more emails and cards about it than any other piece I have written. Great move Cathy! My life with Steve started in a garden and has continued to grow richer with each passing season. 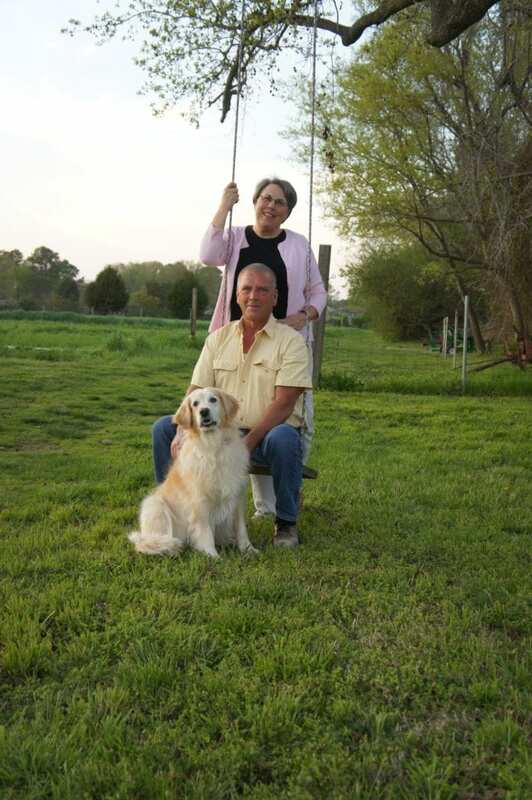 He has encouraged me to pursue farming, teaching, writing, and lecturing. He is the reason I am doing what I do today. His deep-rooted love of eating fresh from the garden and carrying on the traditions of his parents and grandparents has grown into something far greater than a garden. It is a way of life for us. I love growing and gardening, Steve loves fussing over the equipment and keeping it in tip-top shape. This may not sound like an act of love to those that don’t depend on engine-powered tools and a busy farming schedule, but boy, this is a priceless act of love for me! Funny enough, one of the exercises in premarital counseling we attend before we were married 23 years ago was a personality compatibility test. We took the test totally independent of one another. When we went in for the next session, the pastor asked, “did you two take this test together?” We answered “no, why?” His stunned, surprised reply “your answers are identical.” Two peas in a pod we are. I don’t know what sparked Cathy to move the chapter to the front of the book. May have been the mental image of a chopper roaring up the house steps and into the living room or just the sweet story of a guy and a girl meeting and living happily ever after. I’m thankful to claim this love story as mine and to share it with you. Want the whole story? Checkout chapter one in Cool Flowers.